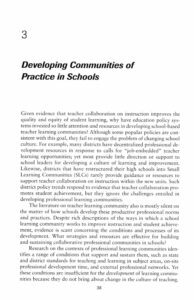 Summary: This book chapter investigates what it takes to make teacher learning communities within schools successful, identifying strong design, skilled facilitation, broadly shared teacher leadership, and school culture as significant factors. Community-building is not just about creating or defining a new work for teachers to do collaboratively. It is also about changing a school’s professional culture. The effectiveness of a community facilitator depends upon the individual’s skills in this role and upon the authority they have or are granted to lead school change. Once legitimized as a leader of change in the school, skilled facilitators can establish new norms of teaching—reflection on teacher with colleagues and co-designing interventions to better meet student needs. Community facilitators create a focus, rationale, and vehicle for teachers to depart from private classroom practice.